One of the many pleasures of having a native plant garden, is the amount of wildlife it attracts to it. 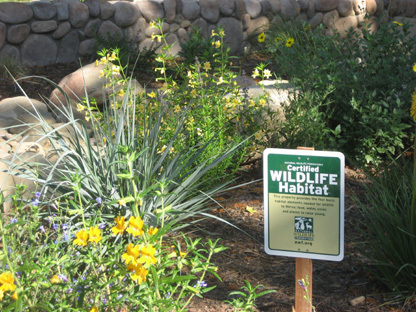 Not only does it provide habitat for the many birds and butterflies but it also provides food and nesting sites as well for birds that live in the area and those that may be migrating through on their way to other areas. It has been four years since I completed the installation of my garden in my front yard, after removing the lawn that was nothing more than ugly Bermuda grass with various sorts of weeds. I hated it, it was boring, took too much water and lacked anything attractive about it and I made the decision to turn it into a chaparral garden, primarily made up of plants from the Coastal Sage Scrub community. There has never been one moment of regret, I don’t miss the “grass” ( If you could call a variation of weeds, “grass”) at all and the best part is my water bill is incredibly low and I have a beautiful garden filled color, scent and wildlife.